The Bicycle Garden Cage set was produced by the people at fingerdance.net and designed by a flourisher named Xiao Wo Zhang. It is said that only 500 pairs were made. 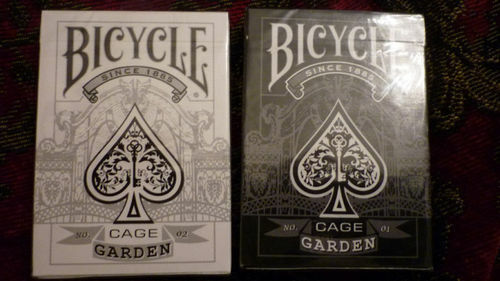 The two decks in the set have a black and white back design, numbered 01 and 02 respectively. They both have white, non-standard faces with relatively small pips and "old style" court cards. Comes with 2 custom Jokers (one is a mirror image of the other), a custom Ace of Spades, and 2 blank faced gaff cards.